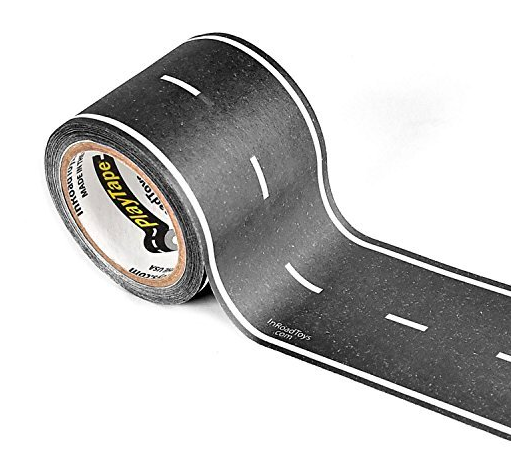 Keeping our toddler occupied during the long cold months of winter just got a whole lot easier thanks to PlayTape Roads! Like most toddlers, Lil’ G-Man has tons and tons of cars in all kinds of sizes that he loves to line up in rows and take on all kinds of imaginative adventures! I think we have a fleet of Lightning McQeens that could rival the largest taxi cab fleets in New York City! Aside from a few mats and small printed area rugs, we didn’t have a real detailed cityscape or racetrack for him to enjoy until we found PlayTape! Constantly changing around McQueens race way on the floor keeps our little man’s imagination from stalling out. This recyclable U.S. made product is non-toxic, safe and easy to use and re-use. If your little one is more into trains then cars, not to worry, Imaginative also makes a re-usable tape in a TRAIN TRACK pattern! The Imaginative kit comes complete with corners and signs! Trolir also makes a road tape kit that comes with 100 detailed signs, however no corner pieces. Previous Will We See Dr. Strange In Captain Marvel’s Post Credit Scene? Wow, that’s pretty cool! My 3-year-old daughter isn’t much into cars, but I need to remember this for the baby boy who’s coming in March! Oh my goodness! My kids would love this! They have the little “city mats” but this would be a great way to combine the mats! I love this and my nephew definitely would love it. Great way to let a child be creative by changing up the design. I love this and my nephew definitely would too. Great way to let a child be creative in changing up the design and their imagination. That’s super cool. Great idea for kids now. My son never had these when he was growing up and that was almost 20 years ago! Oh my goodness, what a clever idea! That is just so fun! I can think of tons of ways to have a great time with this product — cool find.